The thrilling climax to the Ibis trilogy that began with the phenomenal Booker-shortlisted Sea of Poppies.It is 1839 and tension has been rapidly mounting between China and British India following the crackdown on opium smuggling by Beijing. With no resolution in sight, the colonial government declares war. One of the vessels requisitioned for the attack, the Hind, travels eastwards from Bengal to China, sailing into the midst of the First Opium War. The turbulent voyage brings together a diverse group of travellers, each with their own agenda to pursue. Among them is Kesri Singh, a sepoy in the East India Company who leads a company of Indian sepoys; Zachary Reid, an impoverished young sailor searching for his lost love, and Shireen Modi, a determined widow en route to China to reclaim her opium-trader husband’s wealth and reputation. 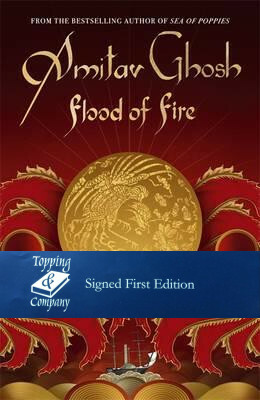 Flood of Fire follows a varied cast of characters from India to China, through the outbreak of the First Opium War and China’s devastating defeat, to Britain’s seizure of Hong Kong.Flood of Fire is a thrillingly realised and richly populated novel, imbued with a wealth of historical detail, suffused with the magic of place and plotted with verve. It is a beautiful novel in its own right, and a compelling conclusion to an epic and sweeping story – it is nothing short of a masterpiece.